It’s a Circus at The Kibitz Room. Once upon a time, I was a “night girl.” I used to go out to clubs any night of the week to listen to live bands and enjoy a cocktail or two, but I’ve grown-up, or more accurately grown older, and it’s not so easy getting by with two or three hours of sleep and expect to function well in any day job, or activities post nightclubbing. But a friend of mine, drummer Bill Spoke, asked me a few months ago if I would come out to Canters Deli and check out the band he plays with occasionally on Sunday nights – the gig starts at 12:00 midnight. It has taken a while for me to get around to it. However, the opportunity arose on Palm Sunday, so I made it to the Kibitz Room, the little bar/nightclub adjacent to Canters on Fairfax. The deli itself has been a landmark business in Los Angeles since 1931, first in Boyle Heights then moved to Fairfax, its current location in the early 1950s. Canters Deli is a Los Angeles celebrity in its own right with a charming history of serving the local community and the rich and famous. The number of stars that have dined there is way too long to list. The Kibitz Room Cocktail Lounge was added to Canters in the early ‘60s and became a hangout/nightclub for deli regulars, rock music fans and top name players like Joni Mitchell, Neil Young, Slash, Jim Morrison, Axl Rose, Frank Zappa, Jackson Browne, Melissa Ethridge, Gene Simmons and many more. The Kibitz Room has always been a place uniquely experienced in Los Angeles. Amid the aromas of corned beef, rye bread, and matzo ball soup, you find a diverse mix of cocktail sipping music lovers crammed into a darkly lit little gem of a “dive bar” club adjacent and accessible to the expansive and bright fluorescent lighting of the 1950s diner/restaurant, Canters Deli. And there’s no cover charge for the nightly entertainment. I arrived around 11:30 PM and caught the tail end of the Tim Russ Crew set. 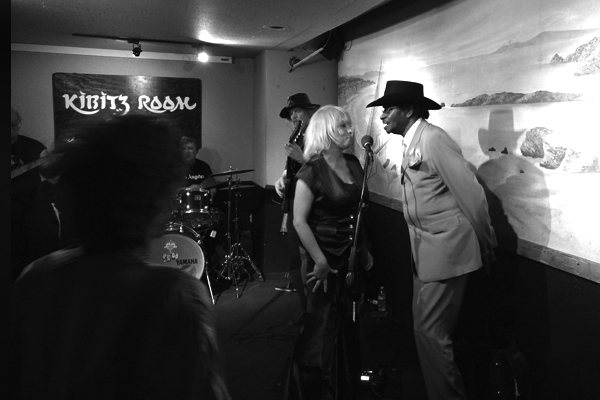 Only in LA could you find an Emmy Award-winning actor with his band playing a rock and blues show in The Kibitz Room. More fans know Tim Russ for his role as Lt. Cmdr. Tuvok on Star Trek Voyager, but his talent extends into many creative areas, and I got the chance to hear Tim’s music chops before the Rock & Roll Circus took the stage. Tim plays The Kibitz Room once a month, and it is worth checking out his show for his rocking funk version of the mash-up “Smoke on the Funky Music.” Also, he does a great blues cover of Joe Bonamassa’s “Dust Bowl.” It was a fine and funky set that revved-up my anticipation for the “R&R Circus” to come. The Circus began 20 years ago in another incarnation as the “Artie Vegas Review,” playing every Sunday at midnight in Canters Kibitz Room. 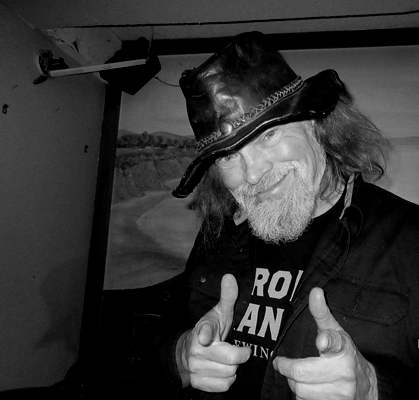 Seven years ago Artie Vegas left the group and then current ringmaster and bass player, Spike Baron took over the gig and changed the band’s name to the “Rock & Roll Circus.” Spike and Willie Mack Chambers were both in the “Artie Vegas Review” band, and Spike manages the R&R Circus, scheduling the troupe of players each week. Spike Baron has been playing bass professionally in bands for 50 years and also has a thriving IT/computer repair business. 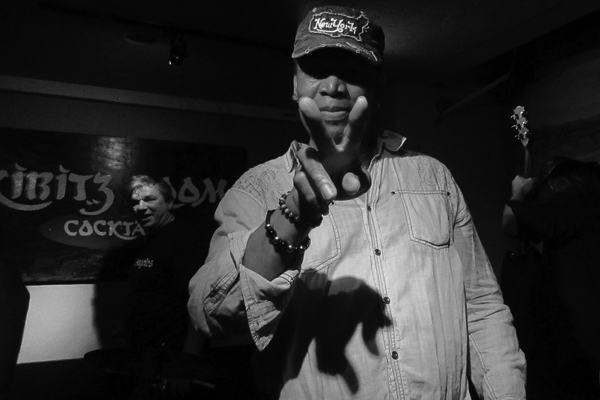 Once Spike took over and renamed the group, he decided to change the format a bit, so the gig was more like a jam session which made it inclusive and flexible for the many different players he has on the Circus roster. The show is successful and fun because of the open format that allows for special guest players and vocalists to sit in, and every singer gets to perform two or three songs of their choice. There are no band rehearsals and no pay for the gig (except for a comped dinner in Canters Deli after the show). The musicians in the band are all professional and play in other groups, or are session players and tour with their bands or with other artists. For this reason, the musicians are booked in the rotation for the Circus gig according to their schedules. There’s an A team of players; Crazy Tomes and John Worley on guitar, and John Mc Kraken on drums. If they can’t make it one week then the B team is called; Bill Spoke and Robin Russell on drums, Jimmy Silcox on guitar, and others who sit in occasionally. There have been horn players, percussion, keyboards, and blues harp musicians that have played in the R&R Circus. And new singers pop in all the time, some just for one night and others come back. 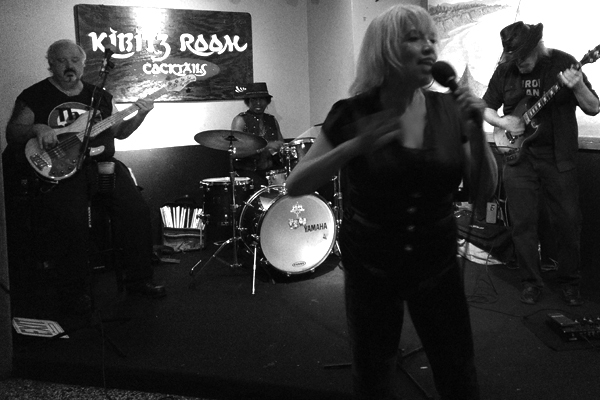 Adelina Madera is a regular singer with Willie Chambers (Chambers Brothers) who also plays guitar. Just before the set started, I sat down with Willie Chambers and Adelina Madero to “kibitz” a few minutes. I asked Willie, “What brings you back week after week to perform here?” With a flash of his 10,000-watt smile, Willie tells me that music is medicine for the soul and it indeed has been his life force. Willie, who just turned 80, is more vibrant than most people and his love of music fuels his energy by performing consistently. Adelina and Willie say it’s the welcoming feeling of family between the band members, audience/fans and the Kibitz Room and Canters’ crew that make them look forward to Sunday nights. The connection, support, and a collaborative flow are the reasons this band performs so well together, even with guest singers and new players that step in and out during a set. The Rock & Roll Circus show at The Kibitz Room in Canters on Sunday nights is a temple of music for band members and the followers who come to the show to be refreshed and saved from the distresses that life often brings. Willie Chambers told me, “You never know what you are going to get each week,” speaking of the show’s format, but I believe everyone realizes they get a soul-enriching joy by being part of the show. 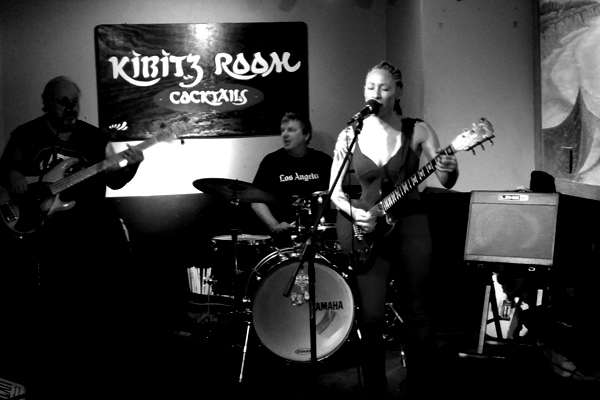 Joining the Rock & Roll Circus can transform your entire week, and you can find them at The Kibitz Room every Sunday. I hope all is well with you. Thank you for coming down for the Rock and Roll Circus show. Did it make you feel like running away with the circus? Lol I enjoyed your article. I hope to see you again soon! Keep up the writing. Thank you, Adelina! Yes, I did want to run away with the circus – the Rock and Roll Circus! You make the show come alive 🙂 Thank you for your kind words and I’ll come to see you all again soon.